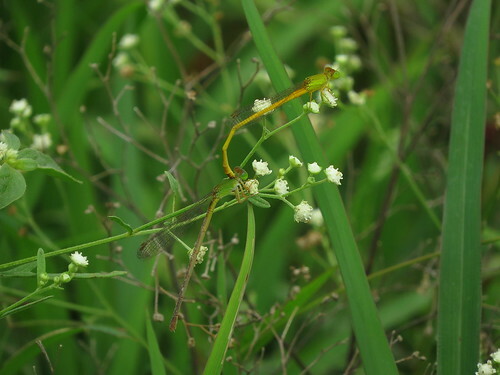 One of the very beautiful tiny insects that will often catch your attention is a needle-like creature that you see close to the edge of ponds and lakes, which seem to float magically in the air before settling, lightly, on a blade of grass. 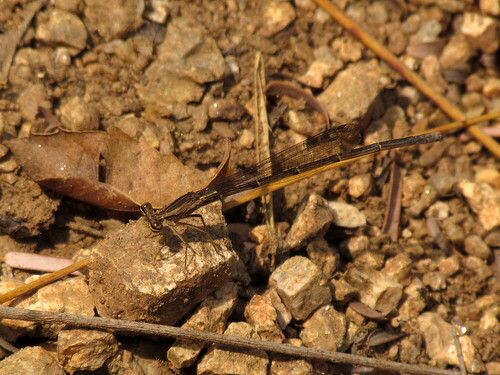 This slelnder, exquisite creature is the Damselfly. Damselflies, like Dragonflies, belong to the order Odonata, and are technically called Odonates. If you are interested in a more detailed name, they belong to the sub-order called Zygoptera. How does one distinguish between Dragonflies and Damselflies? The former have their wings open at right angles to their bodies when they are at rest. 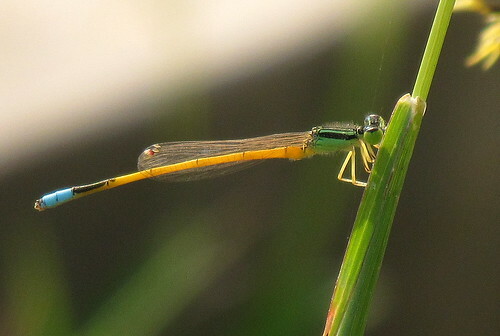 With Damselflies, the bodies are even more slender, and most species fold the wings along the body when at rest. A mating pair form a shape known as a “heart” or “wheel”, the male clasping the female at the back of the head, the female curling her abdomen down to pick up sperm from secondary genitalia at the base of the male’s abdomen. In this picture I took at Jigani kere, they are just about form the heart. 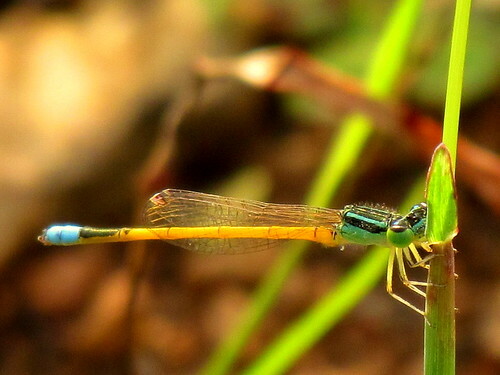 Adult damselflies catch and eat flies, mosquitoes, and other small insects. Often they hover among grasses and low vegetation, picking prey off stems and leaves with their spiny legs. 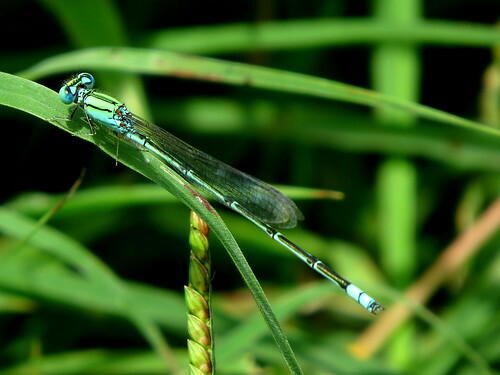 Amazing to know that Damselflies are an ancient group, with fossils known from at least 250 million years ago. Damselflies are found on all the continents except Antarctica. Though most of them spend their lives close to where they hatch, some of them do migrate, as well. How have they impacted our culture? Damselflies have formed subjects for personal jewellery such as brooches since at least 1880. There is also the movie, Damselfly, a 2005 short film directed by Ben O’Connor. So the next time you are walking near water, do keep a lookout for these “flying needles”, and enjoy seeing and observing them! Four contestants for the Gangenahalli ward met citizens and talked about a variety of local concerns from skywalks, playgrounds, stray dogs and cleanliness. How to link Aadhaar card to bank account and LPG connection? Bangalore will get introduced to Direct Benefit Transfer scheme for LPG in the month of December. Before that, the consumers of Indane, HP Gas and Bharat Gas need to link their Aadhaar cards to bank accounts and LPG consumer numbers, if they need subsidy. He has been living in Jayanagar for 45 years and knows the pain points of the locality very well. He passionately works for the betterment of the area where he has spent all his life.